The new Marco Pantani film had its premiere in London’s West-End this week. I went along to see the film and also spoke with director James Erskine about it. Often alone on the mountain climbs upon which he made his name. Ultimately alone in the Rimini hotel room where he died ten years ago, aged just 34. Always, it seems, alone in his own uncomfortable skin. For a man adored and feted throughout Italy for his cycling achievements and celebrated far further for his exhuberent verve in the saddle, Marco Pantani always remained a loner. Even when he was at the very centre of things – both good and bad – he somehow appeared detached. A riddle. An enigma. And that is what drew many of us to him. James Erskine’s new film, Pantani: The Accidental Death of a Cyclist, makes no judgement upon the man known in turn as Little Marco, Elefantino and Il Pirata, and in the Q&A following the premiere in London on Wednesday night, the write-producer-director Erskine made no bones about that omission saying, “We wanted to make an emotional film and show the human cost.” he explained. In contrast to many recent cycling films, the director’s own presence is non-existent in the finished piece and the audience are allowed to make up their own minds as the whether he were ‘Pantani The Saint’, ‘Pantani The Sinner’ or someone struggling with both titles and wanting to be just Marco. Life is much easier when our sporting heroes and villains are one-dimensional. “Four Legs Good. Two Legs Bad.” is easily modified into “1990’s Bad. 2010’s Good” but we all know how that black and white simplification played out in Orwell’s Animal Farm. Despite everything that has happened since Erskine started making his film 3 and half years ago, Lance Armstrong has managed to continue to polarise opinion, still loved and hated in equal amounts, but Pantani always walked a greyer line. Even before the film starts we bear witness to the truth. The BBFC certificate gives the film a 15 rating, pointedly noting that it includes “Drug Use, Injury Detail”. There you have it: in the most literal black and white. We know he cheated to win. So why do we feel differently about Pantani than we do about Riis, Ullrich, Virenque and Armstrong? 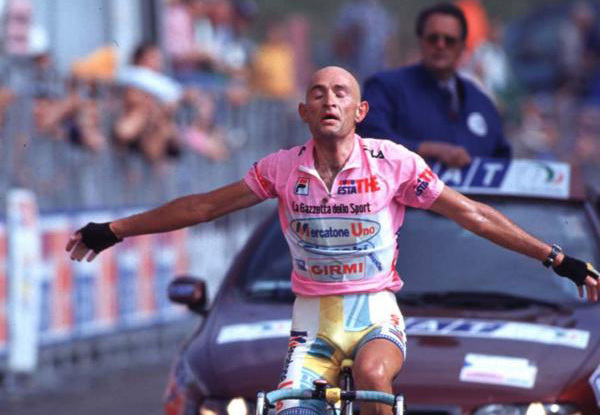 Why is there always a question mark with Pantani’s legacy? The very fact of his untimely death is obviously the key point in that it allows his sporting frauds to be viewed as part of a wider tragedy from which he could not ultimately be saved. Conspiracy theories crop up in the film about his fall from grace in ’99 – the pivotal moment in a career that had already been beset by disappointment and terrible injury – but they seem a side story to the main theme of a little boy lost in the world of men (a phrase which Erskine echoes in our conversation). An innocent. Such a thought would never occur about Riis, Ullrich or Armstrong who were as calculating as they come and who, in the case of Lance in particular, would seemingly stop at nothing to win. They all wanted to lead. Perhaps Pantani just wanted to be followed. There is also a school of thought that suggests it was Pantani’s destiny to be deified and that the manner of his racing subliminally encouraged this. The repeated rises from the dead to claw back time in the mountain’s desert-like wastelands; the faithful disciples at Carrera who followed their messiah enmasse to the new team of Mercatone Uno; the outstretched arms crossing the winning line matching a crucifixion pose. His passing simply fulfilled this role as a tortured soul who struggled with greater highs and lows than those he conquered at the Galibier and Alpe d’Huez. 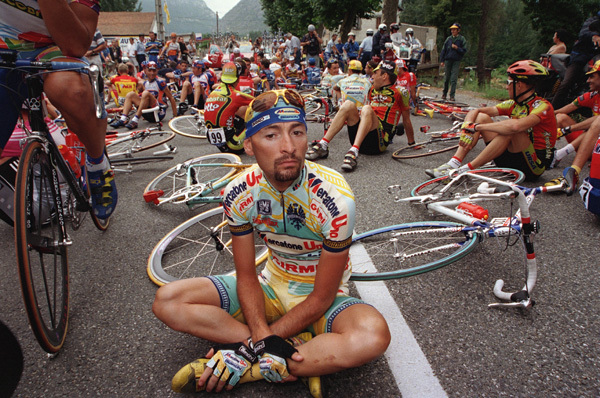 For just one moment in the film we see the anger of Pantani. A still frame of a grimace as he achieves another mountain-top win. For the only time there is fire in his eyes. All the other times, even when battling hard, the eyes are searching for something that is missing. When they close in ecstasy as he wins, he seems to have momentarily found it. But then it is gone again and he is still searching, and we must search with him, for an answer that cannot be found. The film expertly assembles a remarkable amount of archive footage, talking heads, evocative scenery and subtle reconstruction. The archive material is suitably grainy in quality and breathless in it’s commentary and thus is superbly contrasted by the high-definition vistas of the silent Dolomite and Alpine ranges that punctuate the various sequences. The talking heads are superb with valuable input from Greg Lemond, Evgeny Berzin, Bradley Wiggins and Matt Rendell, whose book The Death of Marco Pantani was a key source for the film. It is Pantani’s family though, and his mother in particular, whose words will last longest in the memory. For all the scientific jargon and shots of blood-spinning centrifuges and syringes which dominate the central part of the film, it is her simple warmth and still raw sadness that touches deepest. Erskine tells the story in familiar fashion. The chronological history from birth to death is interwoven with the key achievements and events that defined the career. He likens the format to that of ‘Raging Bull’. We see the pirate conquering The Galibier in ’98 – all yellow wheels and saddle as he floats away in the rain. We see the empty victory atop the Ventoux ahead of Armstrong in 2000. Erskine uses a different filmic device to differentiate each significant win and to individualise them. Deployed partially to help the non-cycling audience they hope to attract and partially to give some texture to what might otherwise become a stylistic monotony of clips, I only noticed it for the first time during the Ventoux segment where I found the device chosen there a bit distracting. I asked James to explain the thinking behind this and highlight the other more subtle tricks they had used. The director also delayed the film’s release by a year to ensure that they had all the family material they needed and it was a wise choice given it’s importance in the finished article. The film has already been released in Italy and, despite falling well short of exonerating their saint, it received a warm welcome from the local partisan audiences. The main wonder was why it was a British team making the legacy film. In truth the film benefits from the distance and balance that Erskine gives it and it’s hard to imagine that coming from an Italian source. Ned Boulting, who along with The Times’ cycling correspondent Jeremy Whittle admirably hosted the audience Q&A after the screening, said during his brief introduction before the film that this is ‘perhaps the greatest cycling story ever told’. Many, including myself, would take some exception with that but none would doubt that Pantani’s is the one of the great tales of modern cycling and after seeing the film I think that all would agree that here it has been expertly told. 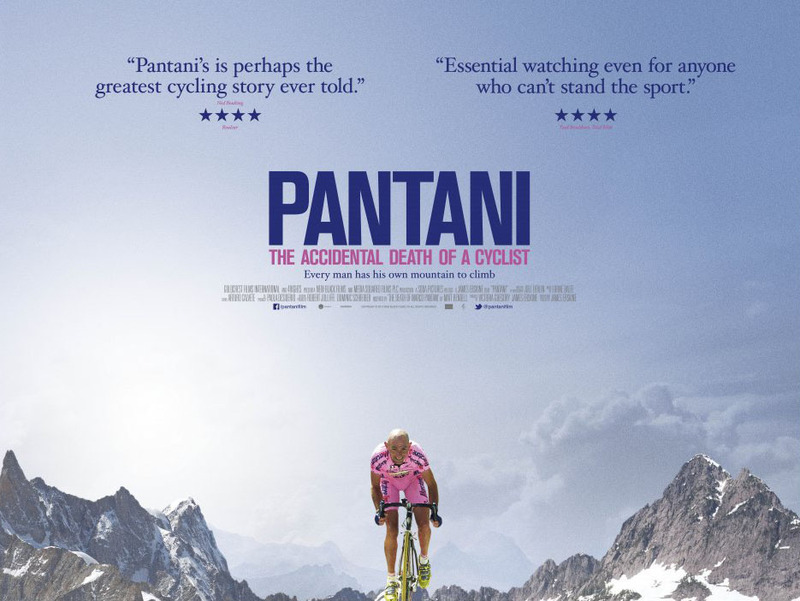 Pantani: The Accidental Death of a Cyclist is released 16th May.|Visit Pantanifilm.com for details of screenings.